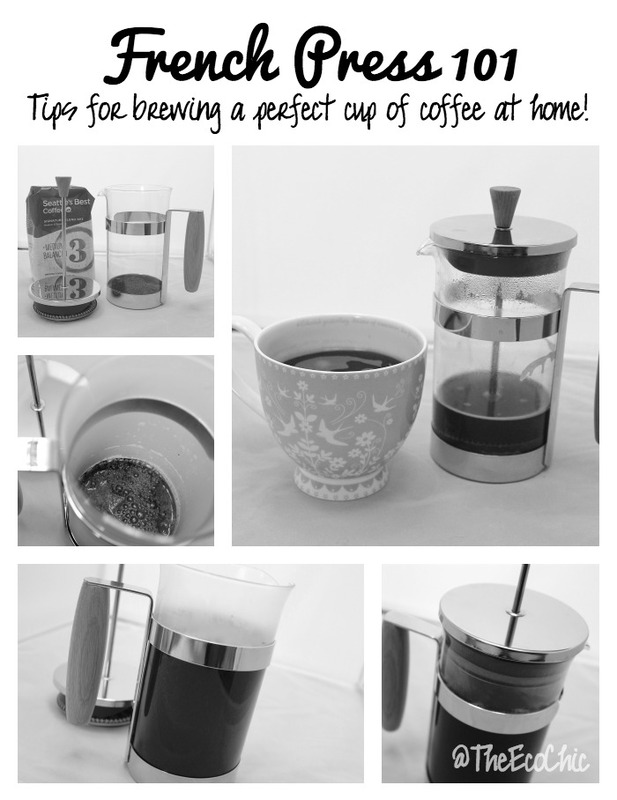 French Press 101 – How to brew a perfect cup of coffee at home! How do you like your coffee? Hot! Intravenously? A few weeks ago a friend introduced me to her French Press. I’ve heard of them before but never researched them or really paid much attention to them. I’ve been either a) Going to Starbucks every morning, or b) refilling my K-Cup and making a cup. As much as I love my Starbucks, I don’t always like making that daily trip to the store and spending the extra money. I don’t really enjoy my refillable K-Cup because the thing ALWAYS leaks. I almost bought a traditional coffee pot but since I usually only drink one cup of coffee a day, it really doesn’t make much since. They also take up valuable space on the counter (which we don’t have much to spare). The French Press has solved all of those “problems” and has actually resulted in a tastier cup of coffee. The French Press has probably been around for ages, but was first patented by a Milanese designer (Attilo Calimani) back in 1929. The features are pretty basic and include a glass beaker with a lid. Inside the lid is a filter and a plunger. The one I found was at TJ Maxx for about $12, you can find them at almost any home store, coffee shop, or on Amazon (affiliate link). The main difference in the models you’ll find is the number of cups of coffee they will make at one time. The one I have will make 2-3 small cups. Traditional coffee post are considered drip brew and the water passes over the coffee grounds and into the coffee pot. Just like the K-Cups and other single serve machines, the water only passes through the coffee grounds. With a French Press, the water saturates the coffee grounds for 4 minutes and then you press the coffee grounds to the bottom of the pot. This will leave the perfect cup of coffee at the top without any grounds. To use a French Press, all you need are coffee grounds, hot water, and your press. I boil my water in the microwave, but you could also boil it on the stove. The coffee grounds should be coarse ground and not fine like what you use in a drip machine. Ideally, you would grind your coffee minutes before you brew a pot of coffee (I haven’t gotten that far yet in my coffee addiction…soon)! For now, I’m just using a bag of coffee that I already have in the house. I’m sure one day I’ll be brave enough to grind my own coffee. Add 2 tablespoons of ground coffee (per serving) to the bottom of your French Press. Add boiling water just to cover the ground coffee. Allow the water to absorb into the coffee grounds for just a few seconds before adding the rest of the water to your press. Continue to fill the water to the top of your press. (The average cup of coffee is 2 TBS coffee to 8 oz of water.) Place the lid (including the plunger – they are attached in most presses) on top of the container and set your timer for four minutes. DO NOT PRESS YET! 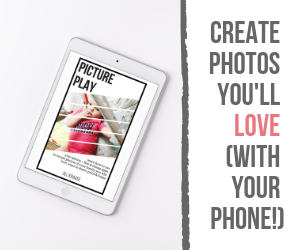 WAIT FOUR MINUTES – CHECK FACEBOOK – SHARE THIS POST! After four minutes (the ideal brewing time for a French Press), you’ll want to slowly press down on the plunger separating the coffee grounds from your brewed coffee. It should take about 30 seconds to push the plunger to the bottom of the container. At this time, you are ready to pour the perfect cup of coffee and start your morning! The whole process shouldn’t take more than 5-10 minutes (including boiling time for the water). How do you like your coffee? Black? Sweetened? With cream? Have you ever tried a French Press? 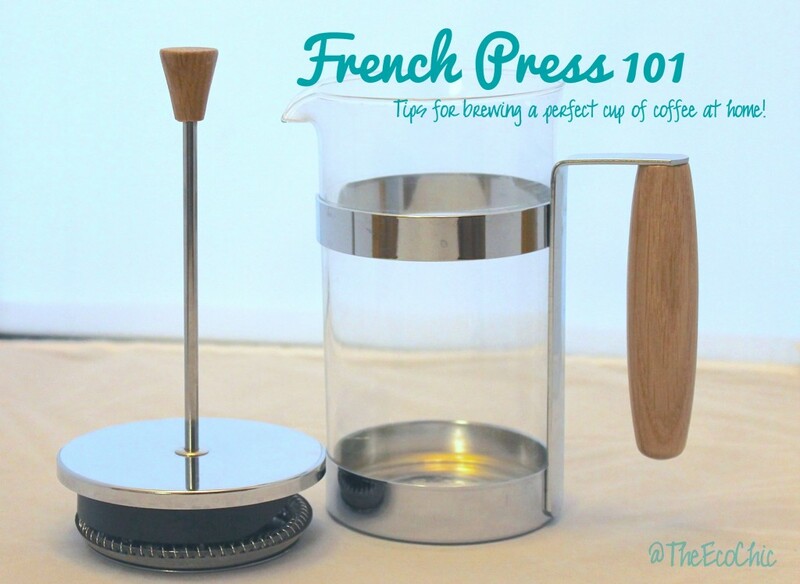 Did you know there are other ways to use your French Press? You can brew a cup of tea, make fruit infused water, make iced coffee, and even make homemade almond milk. I love my french press! I really do think the coffee taste better, AND it’s hotter from a french press than from drip. Since I’m a flavored creamer kind of person, this helps keep my coffee hot even after I add cream. Yes!! I’m addicted to flavored creamers too Theresa! I need to experiment with some homemade creamers that are healthier. I know what I’m going to buy ! This sounds so delicious ! We have one of those too and ŵe love it! And for my birthday I got an extra mini-apparatus to make lait russe!